What Kind of Whales Eat Krill? Whales belong to one of two main subcategories: toothed and baleen. Whales with teeth prey on fish, squid and other ocean life. Baleen whales, also called filter feeders, eat a diet largely consisting of krill, along with plankton and other tiny marine organisms. It's sort of counterintuitive -- some of the largest life on Earth, including the largest, blue whales -- subsist on some of the smallest life, like the two-inch long krill. Baleen whales are so named because they have a substance called baleen, also referred to as whalebone, in their mouths instead of teeth. Baleen is made of keratin, the same as skin and nails, and in fact the material resembles your own fingernails. Individual baleen plates are embedded in the whale's upper gums and made of long, flexible hairs held together by connective tissue. Baleen acts like a sieve to filter krill and other food out of the ocean water. How Do Whales Eat with Baleen? Three feeding styles exist among baleen whales. Gulp feeders, of which the humpback whale is the best-known example, take in huge mouthfuls of water. The whale then closes its mouth and uses its tongue to push the water back out. Krill and other food remain trapped in the whale's mouth and get swallowed whole. Skim feeders, like right whales, swim through krill- or plankton-rich areas of water with their mouths open. Food and water flow in but only water can flow back out through the baleen plates. The whale then uses its tongue to direct the krill and other food down its throat. 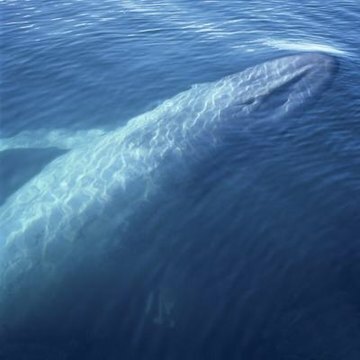 The third type -- the bottom feeding baleen whale -- has only one known example: the gray whale. It plows along the bottom of the ocean, its baleen trapping only food from the disturbed mud and water. How Much Krill Do They Eat? The whales that feed on krill eat a lot of it; most consume about 4 percent of their body weight daily in krill and plankton during a four to six month summer feeding frenzy before they travel and breed. A single blue whale, for example, eats up to a staggering 8,000 pounds of krill every day for a four-month period. Baleen whales significantly exceed their necessary food intake during this time to accumulate blubber for warmth after summer. The largest mammal on Earth, the blue whale, is probably the most famous baleen whale. The humpback whale is another well-known example. The various types of right whales, including Northern, Southern and pygmy, also eat krill as a dietary staple. The same holds true for the different types of minke whales, including common, dwarf and Antarctic minkes. Fin, sei, bowhead, Bryde's and Omura's whales are other whales that rely on krill and baleen feeding for sustenance.